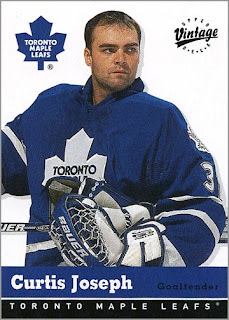 Curtis Joseph retired last week after a 19-year NHL career. 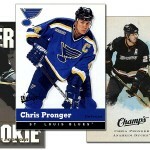 What better tribute than to take a look back at his career–in hockey cards. Below is a selection of his cards, one from each year in his career. Some are off the beaten path, while others are just plain cool. 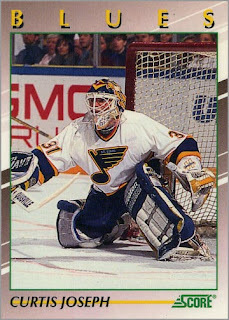 1989-90 Pro Cards IHL – Joseph turned pro with the Peoria Rivermen, but also appeared in 15 games with the St. Louis Blues that season. 1990-91 Panini Stickers – Joseph played 30 games with the Blues that year. Most collectors don’t bother with the Panini sticker sets, but they were always a perennial favorite for me. 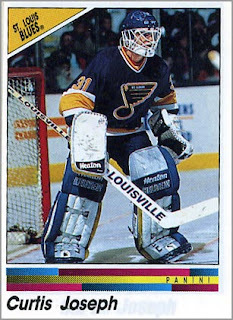 1991-92 Score Young Superstars – At this point, Joseph was gaining traction, playing in 60 games for St. Louis.This was from a boxed set of super-glossy cards that featured the NHL’s brightest young stars. 1992-93 Kraft Peanut Butter – I bet that not many of you haven’t seen this one. 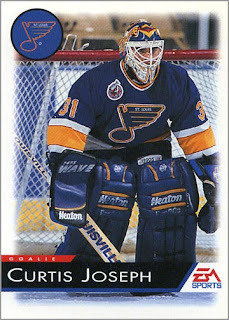 Joseph clocked in at 68 games that season with the Blues. 1993-94 EA Sports – A mail-away set that featured the top NHL players, as well as tips on how to play the video game NHL ’94. Joseph played in a staggering 71 games that year. By the way, I had an article published about this set. 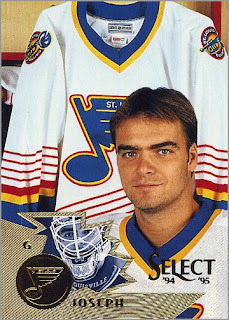 1994-95 Score Select – Since the Blues changed their uniforms that year, all cards of St. Louis players in this set show the player posed in front of the new sweater. 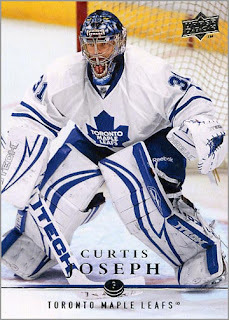 The season was shortened by a lockout, but Joseph played in 36 out of 48 games. 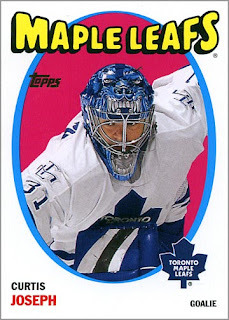 1995-96 Upper Deck SP – Oooooh, shiny! 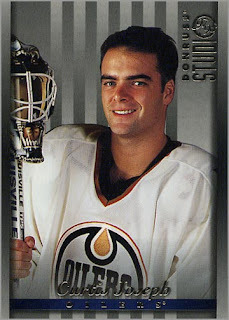 Joseph joined the Edmonton Oilers, playing in 34 games. 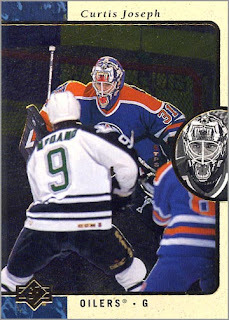 1996-97 Upper Deck – Awesome overhead shot! Joseph appeared in 72 games for the Oilers. 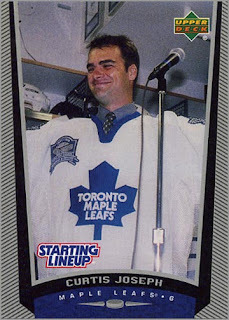 1997-98 Leaf Studio – A nice portrait. Joseph would play a ton of games this year too–71 to be exact. 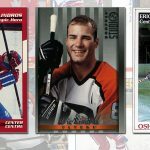 1998-99 Upper Deck (Starting Lineup version) – Notice the lack of foil on the left and right sides of the card, as well as the Starting Lineup logo? 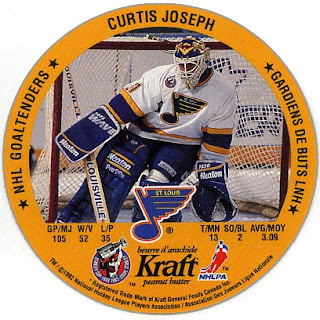 This card came with a Starting Lineup figure of Joseph, and thus it is different than the standard ’98-99 UD card. 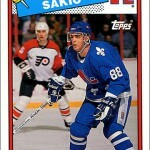 Joseph signed with the Toronto Maple Leafs, playing in 67 games. 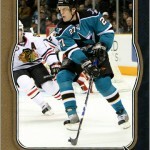 1999-2000 Upper Deck MVP Stanley Cup Edition – Another workhorse season for Joseph, who’d play in 63 games. 2000-01 Upper Deck Vintage – This one looks a lot like Neoclassic French painter Jacques-Louis David’s self portrait. Joseph played 68 games that year. 2001-02 Topps Heritage Parallel – Based on the design of my favorite set–1971-72 Topps–Joseph’s snarling dog mask and his dynamic pose create a sense of tension with the otherwise symmetrical layout. 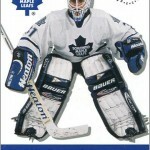 Joseph played 51 games as he finished out his first stint with the Maple Leafs. 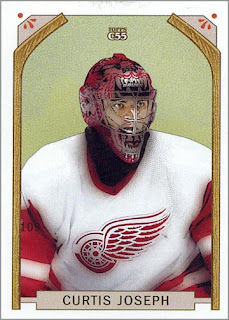 2002-03 Topps – Joesph joined the Detroit Red Wings after Dominik Hasek’s first retirement, playing 61 games for them..Since I don’t have a Joseph-as-a-Red-Wing card from ’02-03, this ’02-03 Topps card of him playing the puck will have to do. 2003-04 Topps C55 – Party like it’s 1911. 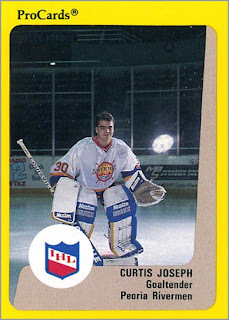 Joseph only played 31 games, as he had to compete for games with Manny Legace and an un-retired Dominik Hasek. 2004-05 was the Lockout, and the season was canceled. Joseph did not play with any team that year. 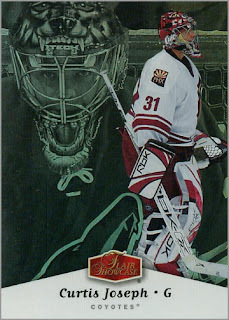 2005-06 Upper Deck – Joseph joined the Phoenix Coyotes as their number one netminder, playing in 60 games. He’d get his 400th win this season. 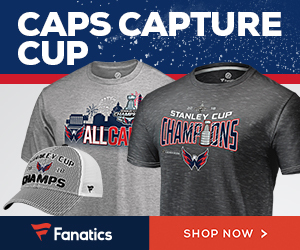 Sprawled on the ice, Joseph’s glove hand is about to cover the puck. 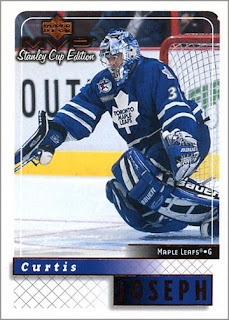 2006-07 Flair Showcase – Just your typical shiny card. Joseph seems poised in the portrait, but introspective in the photo on the right. Playing in 55 games, this would be his last year as a starter. 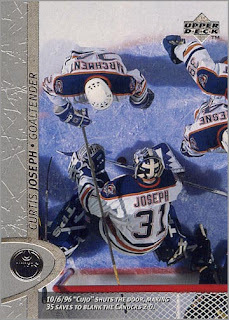 2007-08 O-Pee-Chee – “Wait a minute,” you say, “Joseph didn’t have an OPC card that year.” You’re right–this is a custom card I made. 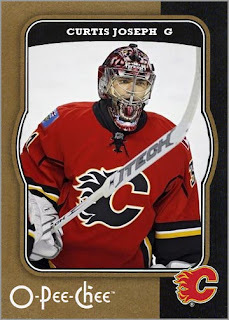 His real cards that year show him with the Coyotes, even though he moved on to be a backup goalie with the Calgary Flames. 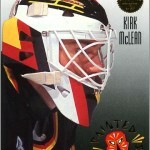 His Flames career lasted 9 games. 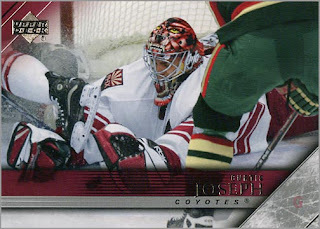 2008-09 Upper Deck – Joseph’s last card…for now. I’m sure he’ll end up in a “Legends” type insert set soon. 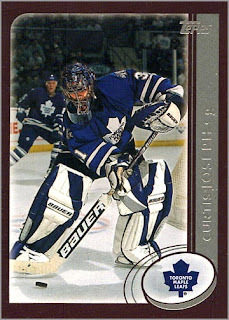 Cujo would have a second, shorter stint with the Maple Leafs, manning the pipes for 21 games. 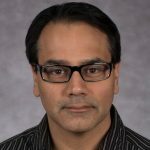 Alas, another player from the 1990s has retired. Joseph finished his career ranking 4th all-time among NHL goaltenders with 454 wins.Conversely, his 352 losses ties him with Gump Worsley for the most losses by a goalie. Regardless, Joseph should be in the Hall of Fame when he becomes eligible in 2012. He had some amazing years and put up some good numbers. 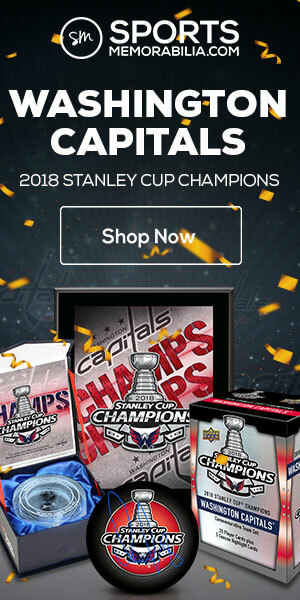 I don't think it matters all that much that he didn't win one. He is fourth all time in wins and the three in front of him and at least three behind him will be in for sure. You both make good points. I'm actually surprised that he lost so many games in his career.